The recent introduction of the Asterion® Ultra alkaline zinc systems has placed a spotlight on a truly integrated approach to reducing rejects and increasing productivity. 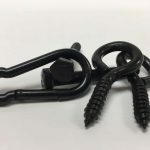 Of special note is the high interest in black trivalent systems that are production-proven to maintain and enhance the appearance of complex part geometries, while not sacrificing corrosion resistance. To address some of the questions (and excitement! ), I’ve authored this blog specifically on Ultra black systems, with a special emphasis on passivate and sealant process operations. Before we move forward it’s important to note that the first All-Star of the Asterion Ultra systems (black, blue, or clear! ), starts with the TECHNIBRITE Ultra Zn alkaline zinc process. Formulated to produce bright, ductile deposits over a wide current density range, the zinc maintains exceptional chromate adhesion, while providing comparable performance to chloride acid-based processes — with the added benefit of better and more uniform plate distribution. Further details on this TECHNIBRITE™ Ultra Zn can be provided by your local technical sales representative. UltraPass trivalent passivates are ROHS-compliant, while offering exceptional corrosion resistance and aesthetics. Environmentally sound alternatives to hexavalent chromates and conventional thick film passivates, UltraPass black passivates provide top-of-the-line protection against white corrosion. Featuring a long shelf life, the trivalent passivates serve as ideal post-treatments for zinc electroplated parts of all sizes and shapes. UltraPass black trivalent passivates are designed with customer convenience in mind. They generally require little to no heating, have a slow consumption rate, and can be fully applied to parts within a couple of minutes. Upon exiting an alkaline zinc bath, parts only require a quick light acid dip to maintain a bright, brilliant color throughout the entire Ultra system processing sequence. While many black trivalent passivates on the market today fail when subjected to even the slightest iron and zinc contamination, UltraPass black trivalent passivates function effectively at iron and zinc tramp concentrations up to 100 and 10,000 parts per million, respectively. While UltraPass black passivates provide exceptional corrosion protection, UltraSeal DT trivalent sealant is sometimes employed to provide an added level of assurance for parts that will be exposed to harsh environments. Ideal for surfaces that have been treated with trivalent chromium passivates or a non-chrome black coating, UltraSeal DT imparts an aesthetic, glossy finish in addition to corrosion protection. Serving as the final post-treatment, UltraSeal DT is highly effective and economical. UltraSeal DT has a robust operating window. Ultimately the most flexible chemical of its nature on the market, UltraSeal DT can be effectively used in concentrations ranging between 4.0 % vol and 15.0% vol. The product is hassle-free and low-maintenance, requiring minimal heating and infrequent replenishment. Storage tanks can be comprised of PVC, 316 Stainless Steel, lined-steel or polypropylene. UltraSeal DT does not require the installation of an extra rinse tank. Parts that exit from the sealant tank can be immediately dried using hot air. Asterion Ultra Black Answers the Call. Asterion Ultra black trivalent systems answer the industry’s call for truly integrated, alkaline zinc systems that reliably and cost-effectively deliver high functionality and esthetic performance. Learn more about achieving the ultimate in corrosion protection. Contact us today.